When you see an article titled (“73% of New Jobs Created in Last 5 Months Are in Government“) you know you need to take a deep breath and say aloud “serenity now.” Because anybody who has paid attention to the Bureau of Labor Statistics reports over the past months and years knows that the public sector (i.e. 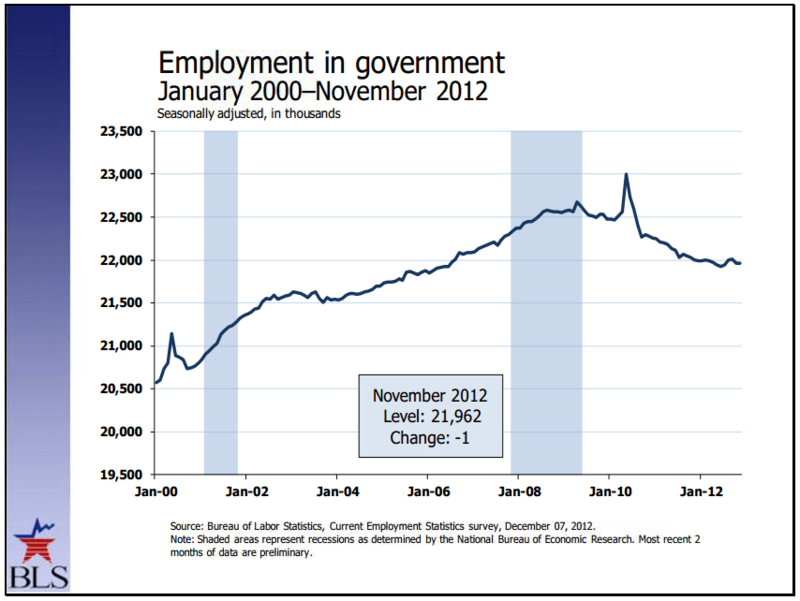 “government”) has shed jobs almost every month in the aftermath of the Great Recession. And if you wish to maintain your sanity, I advise you to steer clear of that article’s comments section. This “73%” article includes numbers as well as links to spreadsheets with even more numbers, but I’ll be honest, I don’t really care to figure out where their error is. Instead, reference the document (“Current Employment Statistics Highlights November 2012“) from BLS which shows concisely the government jobs picture since the year 2000. There is a minor upward trend during the middle of 2012, but if you refer to (“Employment and Earnings Summary Table B”) you will see that this blip of public sector job growth amounts to 96,000 jobs gained from July through September. All other months (except February) had job losses. Net government jobs for the year are negative, just as it was last year and the year before that, and so on. Note that this minor blip during the summer is supposedly where 621,000 government jobs were produced according to the “73%” article. If there is one thing the above chart starkly shows, it’s how hard the Great Recession hit government jobs. So any way you slice it, the “73%” article is total rubbish. • Government employment changed little in November after a decrease in October. • Government employment is 618,000 below its August 2008 level, when employment in both state and local governments reached peaks. • Total nonfarm employment rose by 146,000 in November. • Since the beginning of the year, job growth has averaged 151,000 per month, similar to the average monthly gain of 153,000 in 2011.